As I’ve said in other posts, I appreciate a good looking game table full of terrain. I’m often more captured by being immersed in the aesthetics of a game than the actual game mechanics. One thing that can ruin this immersion for me are objective tokens and other things on the table that simply look out of place. In a pinch, I get it. But, I always prefer to have matching painted terrain objectives on the table. 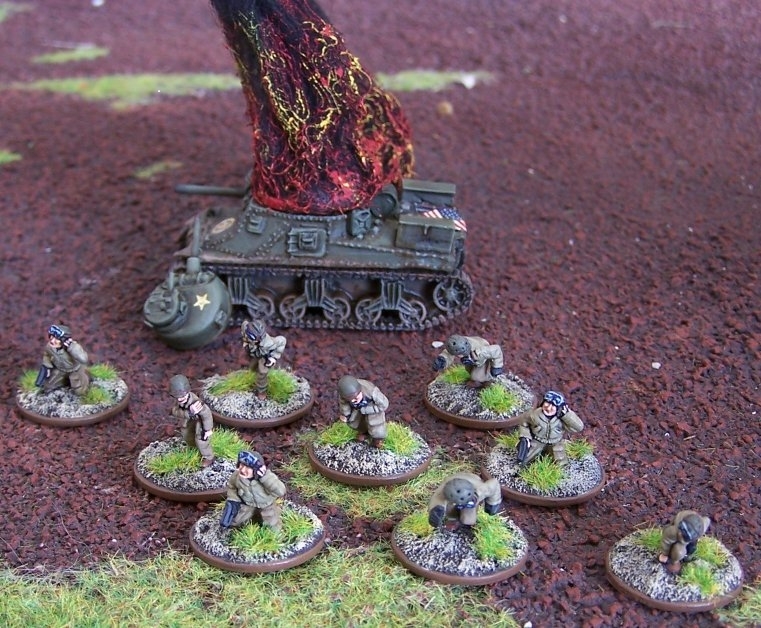 Over the years I’ve painted 15mm WW2 figures to be used primarily for the Flames of War game system. 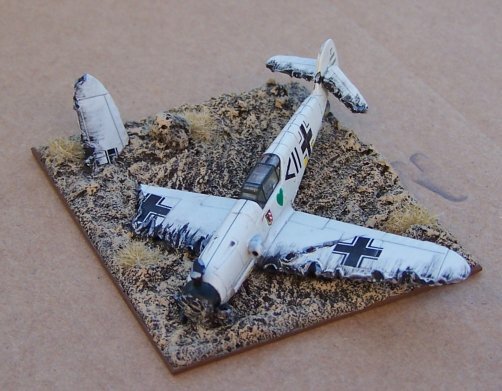 For one of the scenarios, we needed a downed German plane. I had recently purchased a few pre-painted 1/100 scale planes and figured I could sacrifice one for a good cause. A few chops, fresh bullet holes and some paint and I had a new objective marker. Ok, there were a few more steps but you get the general idea. On a similar note, I found using “fire markers” at the spot where a tank gets blasted apart can really make a battle field look awesome (and a good idea of how well or poor you’re doing as a battlefield commander). For Flames of War, I found an easy way of making fire markers using steel wool. I start out by using black spray paint on the washers. This way, the silver from the washers won’t bleed through the final product. The next step involves attaching the steel wool to the washer. I use thick super glue and an CA accelerator like Insta-set. This product cures the glue rapidly which is great for this type of hobby but terrible for your fingers (I have a bad habit of gluing my finger to the model). Steel wool works really because you don’t have to do much to get it looking like smoke and fire. Pull apart the steel wool and it will leave a “tail” that you can simply tear off and then glue to your washer. You might need to flatten the bottom of the steel wool so that the glue has a good surface to attach itself to. Painting steel wool is also very easy. I prefer to spray paint the steel wool black but leaving it grey works just as well. After the spray paint has dried, I added thick coats of red paint. Very little precision went into this step. Just slather it on about 1/2 way up the steel wool. The final painting step was to dry brush some yellow highlights on the steel wool once the red had dried. That’s it. Making this lot of markers took me about 1 hour. Here are some photos of the process described above. This entry was posted in Silver Pants Blue and tagged 40k, Aerosol paint, Drybrush, figures, Flames of War, game terrain, gamer, lord of the rings, miniatures, Paint, Steel wool, Terrain, wargames, warhammer, world war 2, ww2 on June 11, 2013 by Nate. Geek moment – That first time I walked into a game store and saw a huge miniatures gaming table loaded with high quality terrain. From that day on, I devoted a good portion of my hobby time to designing and building terrain. I’ve found that the terrain that’s on the table helps tell the story of the game we’re playing. A few years back, I spent hours building Helms Deep in my garage (+10 Geek XP). I had painted up over a hundred Uruk-Hai and just as many men of Rohan but it wasn’t until I could place them on those castle walls that the game scenario felt complete. Currently, my game table at home resembles The Shire with rolling hills, trees and hobbit holes. I enjoy building terrain so much that I created a few pieces for Pegasus Hobbies which manufactures high quality pre-painted terrain. Today I thought I would share some simple steps to make good looking game terrain, specifically steep rocky hills. While I prefer thick pink/blue insulation foam to create terrain, it can get quite expensive and in some places, hard to find. I had great luck finding foam pieces at furniture stores, used to protect the furniture during shipping. As you can see from the photo, I found a large piece of white “bead” foam. While not initially as strong as other types of foam, it’s readily available in my area. To create a strong base, I glued the foam to a 1/8inch piece of masonite board. Using a jigsaw, I cut through the masonite to form the base of each hill piece. The jigsaw left rough edges on the masonite so a little sanding was required. I also needed to use a long serrated kitchen knife to continue the cut through the 10 inches of foam. The next step is the most “creative” in the process…shaping the foam piece itself. Depending on the size of the foam, you can create tunnels, ledges and crevasses. Again, using either a serrated knife or a hot foam cutter, simply “sculpt” away. It’s important to remember that while realism is desired, the terrain piece also needs to be practical. 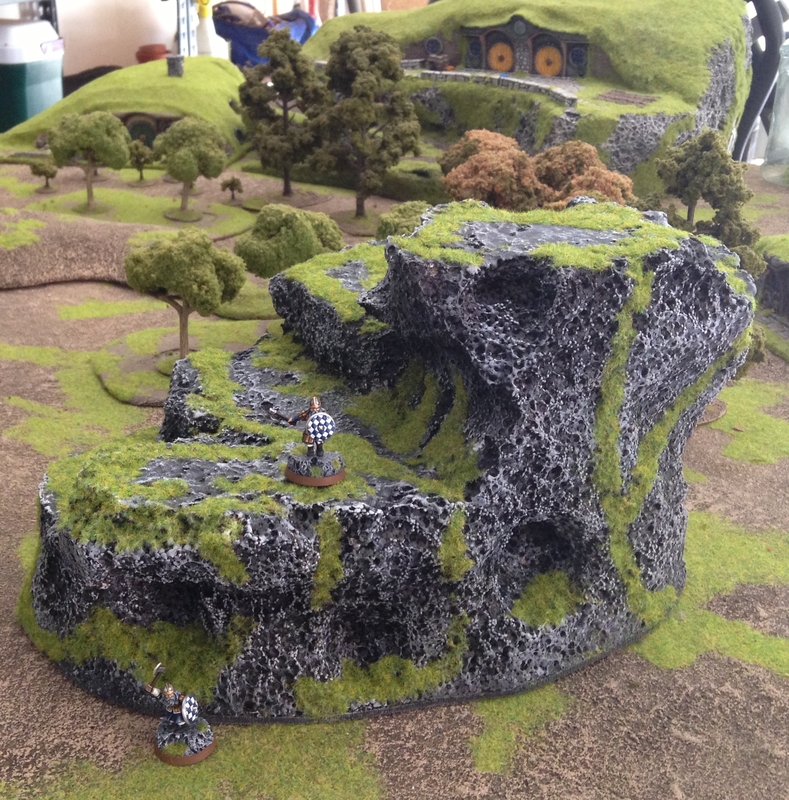 In the case of these rock hills, I created tiered flat ledges where I could place miniatures. To both strengthen the foam and to give it texture, I use a heat gun and carefully “melt” the foam. You will want to test out this technique on a spare piece of foam first as you can easily melt the foam too quickly. While not necessary, I’ve been using a thin layer of Foam Coat which essentially seals and protects the foam. I used a thicker coat on all of the places where I would eventually place miniatures. Once the terrain piece has been shaped, it’s ready for a few coats of paint. 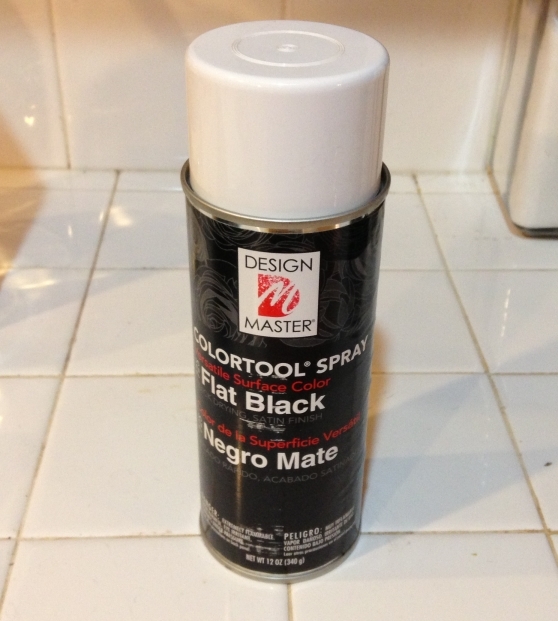 I prefer to base coat foam with Design Master paint as it’s one of the only spray paints that won’t dissolve the foam. Alternatively, I’ve used acrylic paint sprayed through and air-brush. Next, I use an inexpensive craft paint and using a large paint brush I “drybrush” on a heavy coat of grey paint over the black base coat. Once this first coat is finished, I drybrush a second layer of white paint for highlights. Finally, I wanted to add some grass to the hills and my preference is to use a light green Static Grass. I simply painted on some white glue and sprinkled the static grass over the glued area. Once dry you can blow off the excess static grass. Hopefully, this simple tutorial will be helpful for those of you who are interested in building your own terrain. Feel free to add your own tips and suggestions! 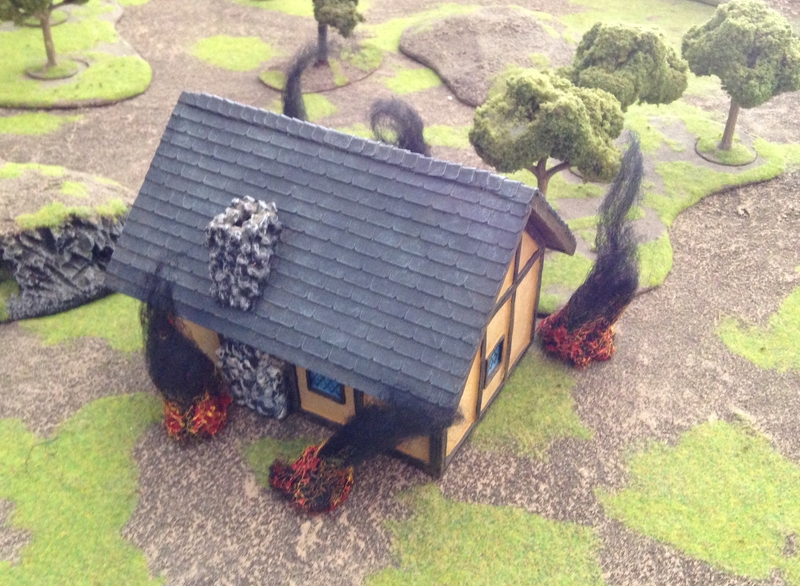 And, post photos or link to your finished terrain pieces! This entry was posted in Silver Pants Blue, Uncategorized and tagged Bacon, Foam, game terrain, Games Workshop, hills, hobby, Paint, polystyrene, Styrofoam, Terrain, wargame on May 25, 2013 by Nate. Much like a painting with no picture frame, a painted miniature with a boring base does not help in spotlighting this figure that you’ve been working on for so long. I have plenty of “average” bases that I’ve done over the years but decided a while back that I would start basing my miniatures in a way that doesn’t distract but helps the figure stand out a little more. After my recent post on painting the 25mm LOTR Dwarves, I was asked a few times about the bases that I used, so I thought I would take a moment to share the technique to make those bases. I admit that this process was simply borrowed from someone else and hopefully showing this simple process will be helpful to anyone out there who wants to improve the look of their finished miniatures. These bases require the original base that came with your miniature, thin super glue and cork board. If you don’t already have some handy, head down to your local office supply store and buy a pack of cork board (you only really need a couple of small sheets). Next, super glue the top of each plastic base and place them face down on the cork (I usually do this in batches of 20 bases or so). 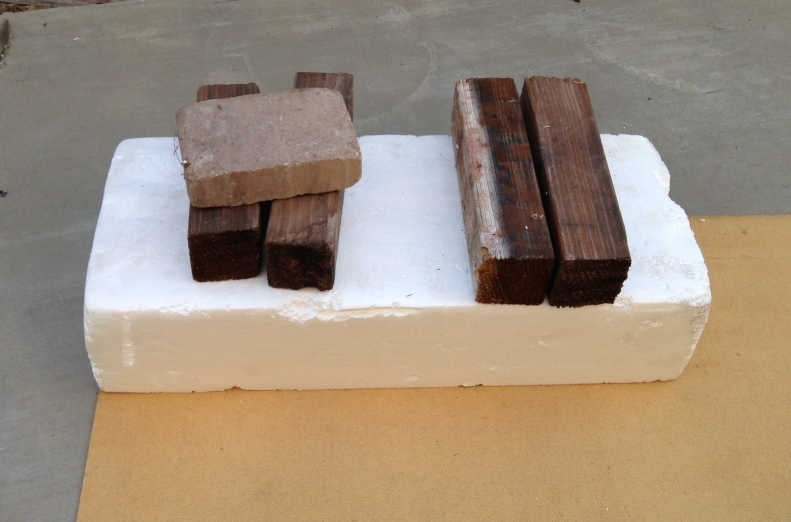 After the super glue has dried, simply break or cut the bases into individual pieces as seen in the photo). The next step is to simply break off the excess cork around the miniature base so that it creates a jagged look. Using a hobby knife, I then begin to dig into the surface a bit, creating channels and grooves in the surface. The final step that I found helpful is to seal in the cork by simply adding a layer of the thin super glue to the surface of the miniature. The cork will naturally absorb the glue and the final product will be an solid surface. I have also used a thinned coat of white glue to create a similar effect. Once dry your base is ready to paint. This process does require more work the end result is a better looking miniature. This entry was posted in Silver Pants Blue, Uncategorized and tagged Adhesive, Bacon, Cyanoacrylate, Games, Miniature, Miniature Bases, Miniature figure (gaming), Paint, Role-playing game on May 16, 2013 by Nate. Maybe it’s the stocky, tough and sometimes comical nature of Dwarves, but they always seem to be my favorite characters in books I’ve read (Tyrion Lannister anyone?). About a month ago, I finally broke open the set of plastic Dwarf Warriors by Games Workshop and began the task of painting all 24 at the same time. 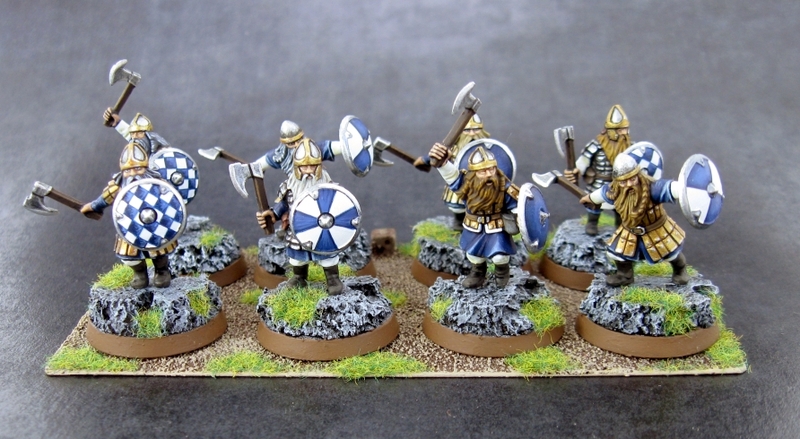 My goal with these (and most of my miniatures) was to paint them to a good tabletop standard and also attempted to match them to the same color scheme as some dwarves I painted almost a decade ago. I had entered those miniatures in my one and only Games Workshop Golden Demon painting competition and took second place. 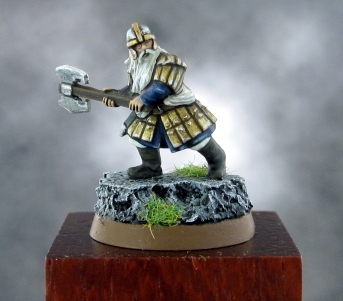 Below are a few of dwarves I’ve painted up recently and more can be found in the gallery. A few years ago, I also tried my hand at sculpting. Ents were an easy place to start simply because if you messed up, it just became part of the tree’s bark. I soon gave up sculpting, recognizing that it’s just not my thing (and I’m waiting for my own 3D printer anyway). 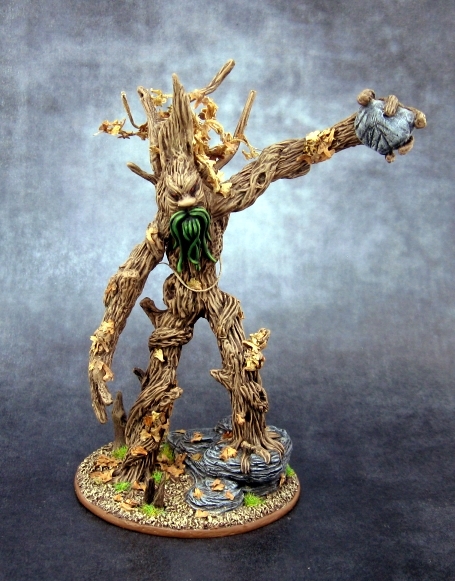 You can see more photos of these “masterfully” sculpted Ents in the Gallary along with a number of other figures that I recently uploaded. Note: I’m still trying to figure out how to photograph miniatures and while I think the photo’s are good, they are simply lacking the detail I would like to get. I currently use a Canon Powershot A590, tripod, good lighting and lightbox. Someday, I hope to get a DSLR but for now, the Canon will do. This entry was posted in Silver Pants Blue and tagged Bacon, Games, Games Workshop, Golden Demon, Miniature figure (gaming), miniatures, Paint, Shopping on May 9, 2013 by Nate. 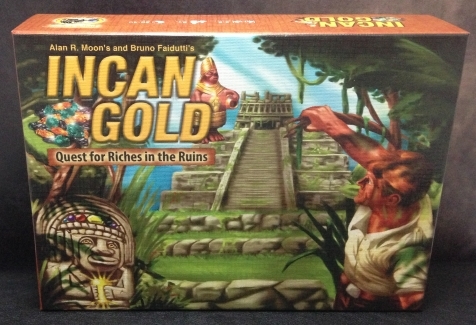 The first game we are going to explore is the board game Incan Gold by game designers Bruno Faidutti and Alan R. Moon. This is one of our favorite family games, can be played in 15 minutes or so, and Maddie usually crushes the rest of us each time we play! The table-top game can be played with up to 8 people and for the purpose of the large group game, we’ll follow the same specification. Incan Gold’s theme is that of adventurers exploring Incan ruins in search of treasure. The primary game mechanic in Incan gold is often referred to as a Press Your Luck mechanic. In each of the five rounds, each player must decide repeatedly and secretly to either continue deeper into the ruins in search of more treasure or leave the ruins with the treasure they have already collected. Stay in the ruins too long and you could lose everything. Each time you and the other explorers continue on in your search, you will find either a treasure card or a danger card. When a second danger card of the same type is turned over, all the exposed treasure is buried, leaving the remaining adventurers with nothing. You’ll have to decide to either leave the temple with the treasure you’ve already collected and store it at your “camp” or to “press your luck” and continue on. The game consists of 5 rounds, reshuffling and refreshing the danger and treasure cards each round. Whoever has the most treasure is the ultimate explorer and winner! This game would easily work with your group right out of the box, but my suggestion would be to break the larger group up into 8 teams (even teams are not necessary). 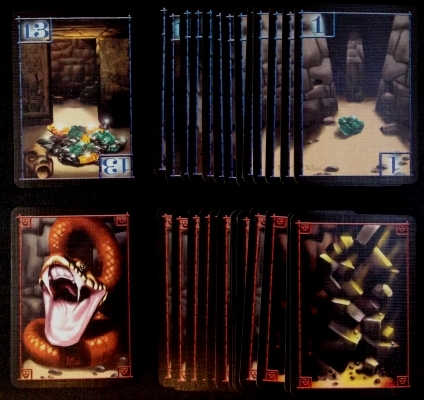 After explaining the rules, preferably on screen, distribute two poster sized cards to each team, one indicating that the team is staying in the ruins and one indicating that you are leaving. At the start of each phase, teams will collaborate on a decision. The leader will countdown from 5 and all the teams will then raise their poster choice in unison. 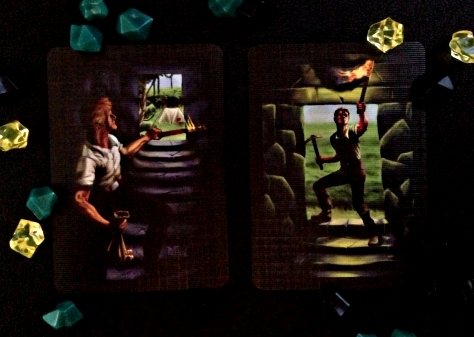 Next, a card is pulled from the deck indicating either treasure that the remaining teams will collect or it will be a danger card, potentially ending the round. Play will continue in this fashion until 2 danger cards are pulled or everyone has left the ruins. After 5 rounds, the game is over and a team will emerge as winner. A visual representation of the treasure and danger cards on a large screen would be ideal but oversized cards could work as well, as long as each team can see what cards have been played. Each team should also scream out in unison their decision along with holding up the card. Use the Raiders of the Lost Ark soundtrack while playing the game as ambiance. Choose teams by class grade, age, school, birthdates, etc. Create a new theme entirely: Getting back stage to meet a rock band, road trip, space exploration, etc. I would encourage you to buy a copy of the game, as it’s a phenomenal game played as intended, but if you do decide to play your own version, having the game components could prove useful. Regardless, you can find the rules and more here at Boardgamegeek.com. This entry was posted in Uncategorized, Youth Resources on April 25, 2013 by Nate. As mentioned here, I’ve had a life-long obsession with Star Wars. From the movies themselves, the John Williams soundtrack, the X-Wing vs. Tie Fighter PC game series, the countless collectibles, and everything in between. The franchise has had it’s ups and downs, but I still geek out over the universe that Lucas created. 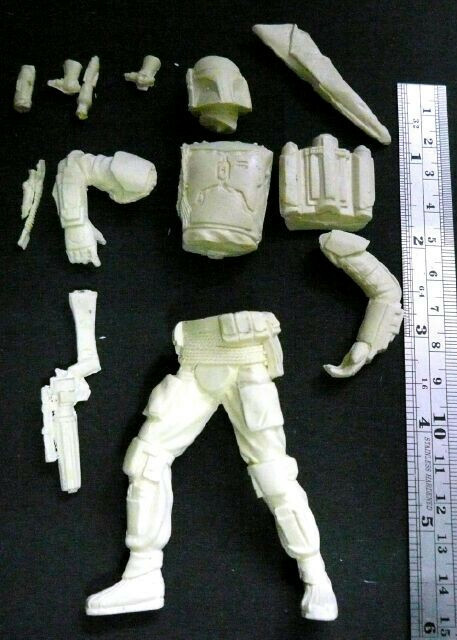 While Vader might be the most popular Star Wars character, many would agree with me that Boba Fett is simply the coolest. Like Patton Oswald, I expect the opening scene from Episode 7 will involve Boba Fett climbing his way out of the Sarlacc Pit … this must happen. This entry was posted in Silver Pants Blue and tagged airbrush, boba fett, model, painting, starwars on April 5, 2013 by Nate. Hi. I'm Nate and I'm a geek. Enter your email receive notifications of new posts.